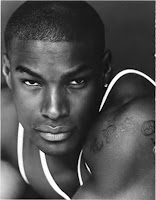 Tyson Beckford is the first black male supermodel. He is best known for appearing in Ralph Lauren's ad campaigns. In 1991, he was recruited to hip hop magazine "The Source" by a talent scout who had come across him by chance in a New York park. In 1993, Tyson was recruited by Ralph Lauren as the front model for the company's Polo line of male sportswear. Beckford was named 'Man of the Year' in 1995 by the cable television music channel VH1, as well as one of the '50 Most Beautiful People in the World' by People magazine. Tyson's parents are both Jamaican. His father is Afro-Caribbean and his mother is of Chinese Jamaican heritage. He has also appeared in various movies including "Zoolander" and "Into The Blue".